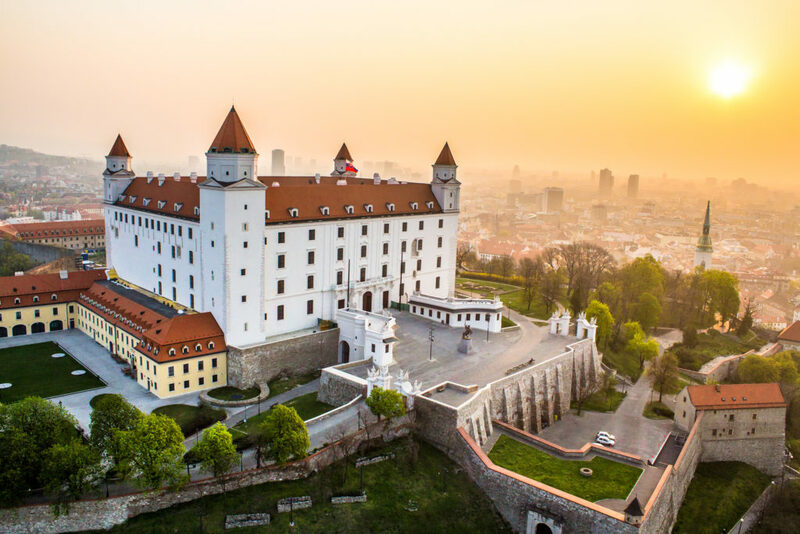 Perched on a hill, Bratislava Castle looks out across the city that spreads below it, the River Danube that flows beneath it, towards Austria in the distance and, on a clear day, even out as far as Hungary. Bratislava Castle (Hrad) has something of a chequered history, having been attacked and severely damaged on several occasions, most recently in 1811, when a fire gutted the building. 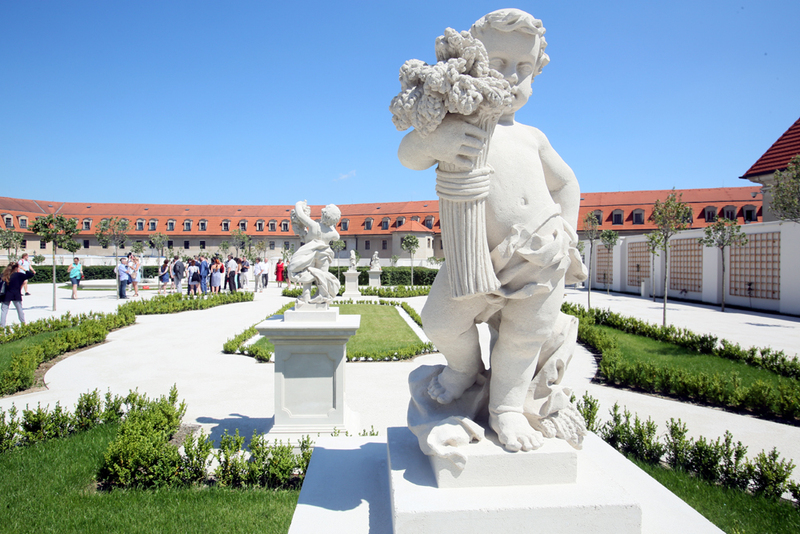 It wasn’t until 1957 that the castle was eventually restored, but today it makes for a striking structure, surrounded by beautiful gardens that offer a lovely view across Bratislava and towards the distant countryside. The castle, which is protected by its UNESCO World Heritage designation, also houses the Museum of History (all under the umbrella of the Slovak National Museum), where visitors can learn about society in Slovakia from the middle ages up to the present day. 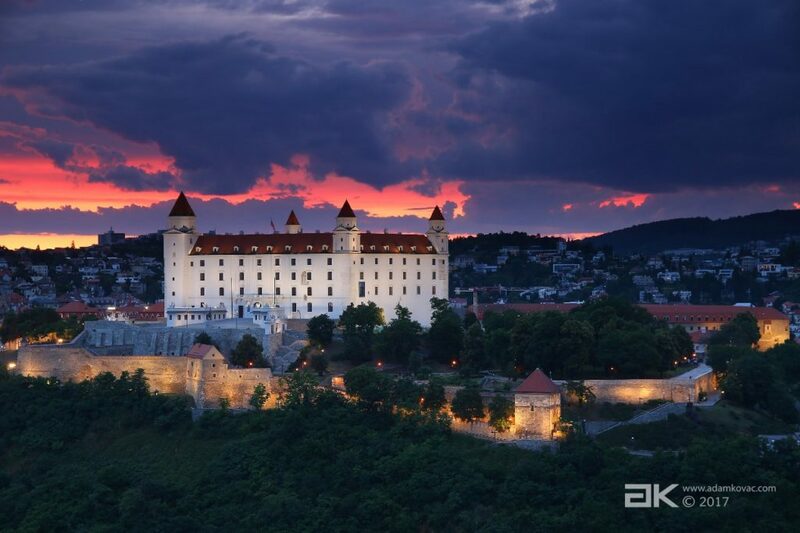 The monumental edifice of Bratislava Castle is visible from a great distance and every visitor to Bratislava will be unable to miss or avoid being transfixed by its dominant silhouette. The majestic impression is further enhanced by the hill it rests upon, some eighty-five metres above the level of the Danube River. Known as the “symbol of Bratislava” the castle is undoubtedly the city’s most popular sight and one you should definitely visit during a stay in Slovakia. The first known inhabitants of the castle hill were Celts and Romans, and the castle itself used to serve as a defensive fortification to protect against enemies. Bratislava and its castle later became a crucial part of the Austro-Hungarian Empire. You can access the castle by either car or public transport, and by foot from the city centre it takes just 15 minutes to get to it. The baroque gardens to the rear of the castle are amazing and the castle itself is huge, along with its esplanade with front gate that is amazing. The view over the Danube and the city is unmissable. The physical realisation of the garden underwent a strict process of approval by historians and architects – every tree, wall and statue has a historical significance. The gardens are also available for venue rental – ideal for official, political events, for sustainable events for corporate partners, food festivals, concerts and many other kinds of events. The Summer Shakespeare Festival is an open-air theatre show of the works of this world famous English playwright. The idea to organise the Summer Shakespeare´s Festival was conceived in 1990 by Václav Havel, the former president of Czechoslovakia, who wanted to animate Prague Castle during the summer time and make it more accessible to visitors. The festival was later brought to Slovakia and it is now held in the unique open-air scenery of Bratislava Castle. The theatre festival is always held in the first half of the summer and every year focuses on a different genre, such as on the tragedies like Romeo and Juliet, King Lear or Hamlet, or comedies such as The Merchant of Venice or Twelfth Night. 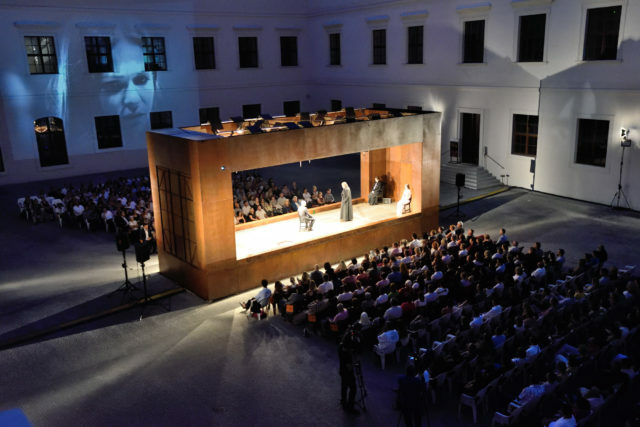 The plays are performed by the most important Czech and Slovak troupes and, to please English speakers, some plays are even performed to the original text.